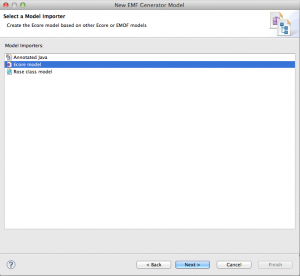 The following article explains, how to use OCL constraints on an existing model in order to validate the model, which is created by a graphical editor supplied by GMF. The explanations are based on a simple EMF/GMF project, which is explained here. Install the package OCL Examples and Editors. The project we created in the previous tutorial lets us create simple business processes, including “events” and “processSteps”. Right now there is no order, an event may follow and event and a processStep may follow a processStep. In this example we are going to add constraints, which define, that an event only follows a processStep and a processStep only follows an event. 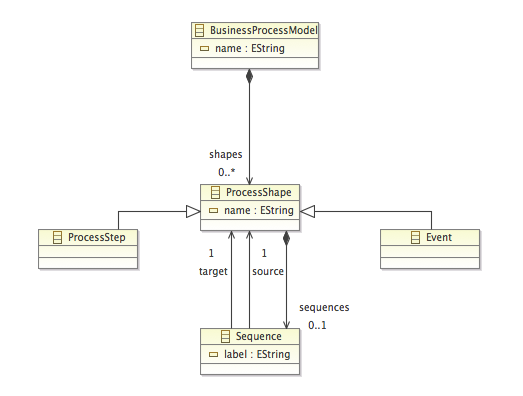 UML representation of the model. “oclIsTypeOf” compared the used type, we check the type on the source and the type on the target. Right-click the .ecore file in the project. Click on “Open With” and choose “OCLinEcore Editor”. 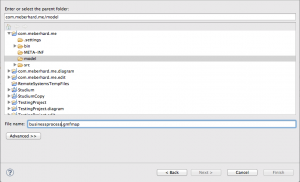 Open the .ecore file using the OCLinEcore Editor. 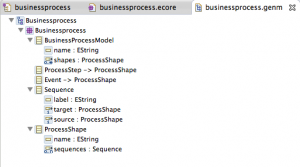 Reload the .genmodel file after applying changes to the .ecore model. 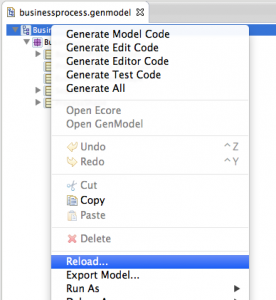 Generate Model Code after reloading the .genmodel. 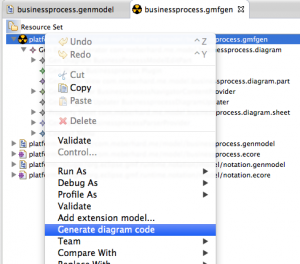 View the properties of “Gen Diagram BusinessProcessModelEditPart”. Use the properties to search the group “Diagram” and change the values “Validation Decorators” and “Validation enabled” to “true”. Set Validation Decorators and Validation Enabled to true. 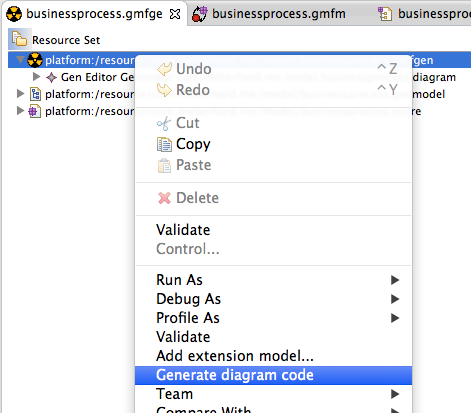 Save the .gmfgen file, right click the first element and click on “Generate diagram code”. Generate the new diagram code. 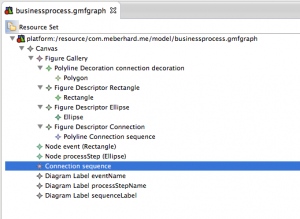 Add a businessprocess diagram file. Click on “Window”, “Show View” and select “Problems”. The problems-view will inform us, if the model violates our OCL-constraints. Add the problems view to see OCL constraint violations. After this is done, we can try the validation. 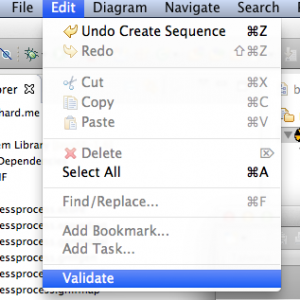 Add two events and link them – this is not valid because an Event should be followed by a ProcessStep. Add an invalid process linking an Event to an Event. Invalid sequence between two Events. 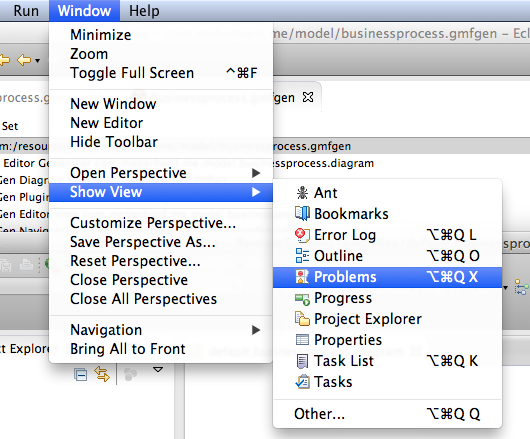 The problem view informs about the OCL constraint violation. 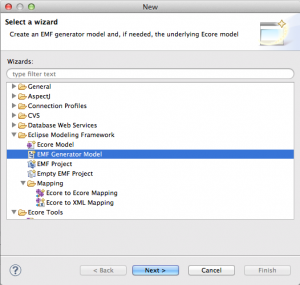 This entry was posted in Uncategorized and tagged eclipse, emf, gmf, model validation, ocl on July 20, 2014 by Moritz Eberhard. 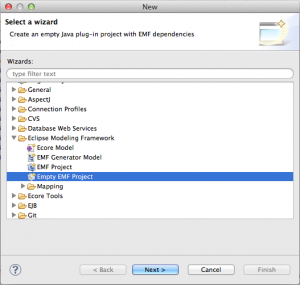 This is a small tutorial introducing EMF and GMF plugins of Eclipse. 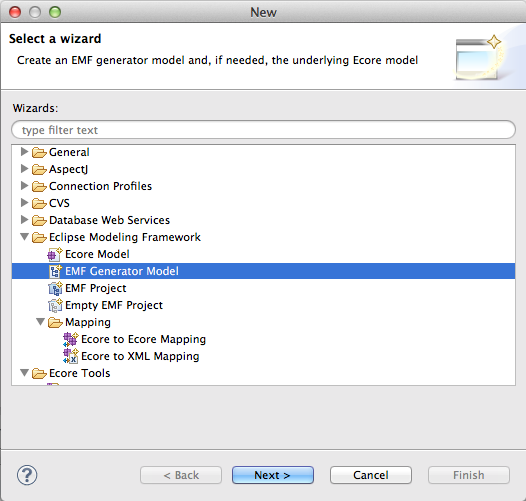 EMF is the abbreviation of “Eclipse Modelling Framework”. 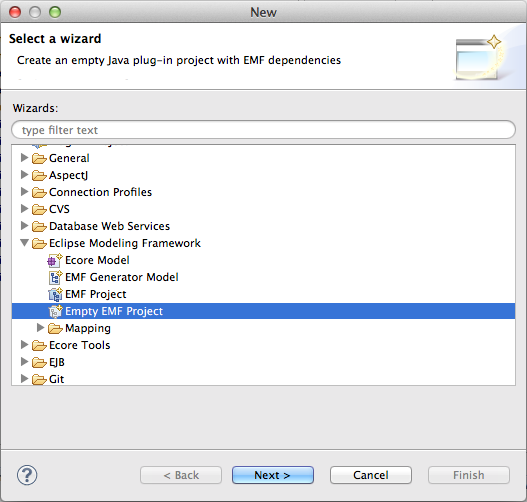 Using EMF, models may be created and the java code for them is automatically created. 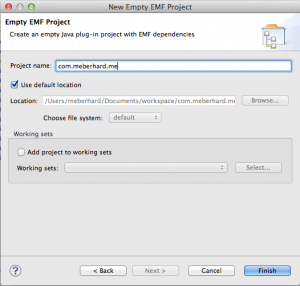 Furthermore, EMF gives the possibility to generate code for an editor using the created model. This editor may be launched as an Eclipse application, which uses the defined model and gives the user the possibility to create model instances. GMF extends this functionality: Notation symbols may be matched to model types and associations. 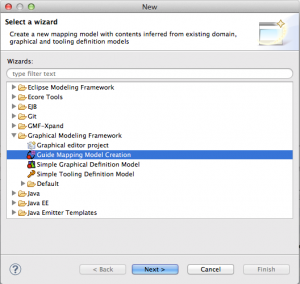 Based on the definition of notation symbols and the matching, java code for a graphic editor can be generated. 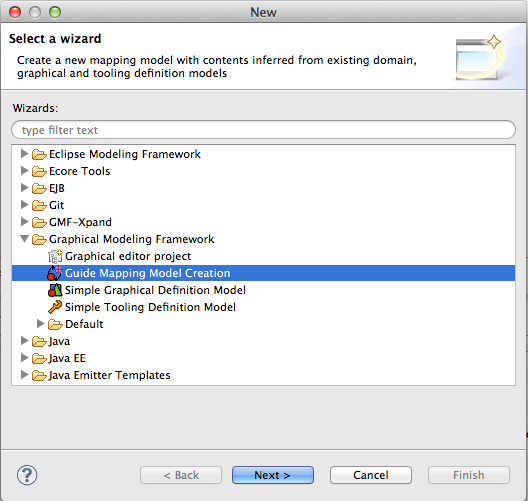 Launching it as an eclipse application, the model instances can now be created as a diagram. In this tutorial I will give a brief introduction, how to use EMF and GMF. 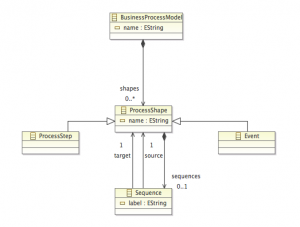 The model will be a very basic business process model, which consists only of events and process steps. The goal will be to have a graphical editor, which may be used to create a business process using events and process steps. Basically this editor will be created without writing a single line of code. 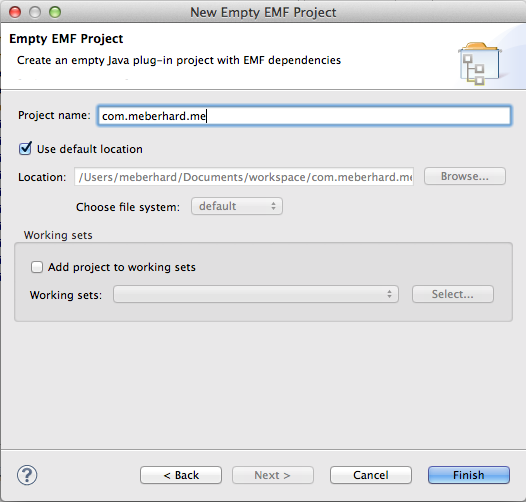 Creating a new project, choose “Other” and select “Empty EMF Project” in the “Eclipse Modeling Framework” folder. Choose a project name and click “Finish”. Next step is to create an EMF Ecore model. 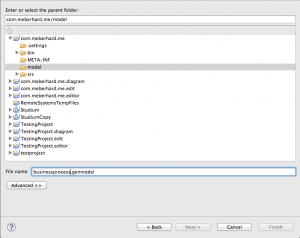 The project, which we just created, contains a folder named “model”. Right-click this folder, and click “New” -> “Other”. Select “Ecore diagram” in the “Ecore Tools” folder. The model folder should now contain two files: “businessprocess.ecore” and “businessprocess.ecorediag”. 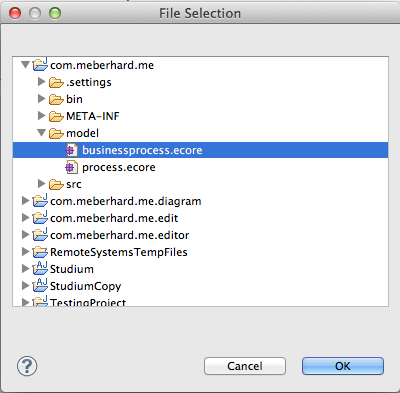 On opening the ecorediag file an editor will show, which lets us create the model in a graphical environment. 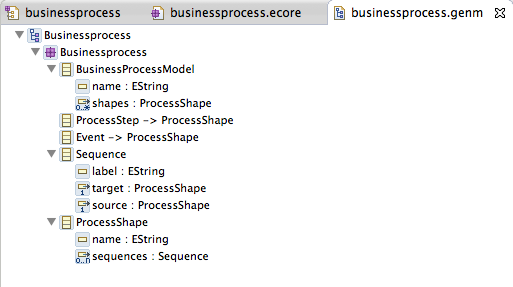 Let’s create a basic EMF Ecore model, containing the class ProcessShape, which could either be a ProcessStep or an Event. ProcessShapes are connected using a Sequence. In order to create this model, we just need the types “EClass” and the connection “EReference” and “Inheritance”. 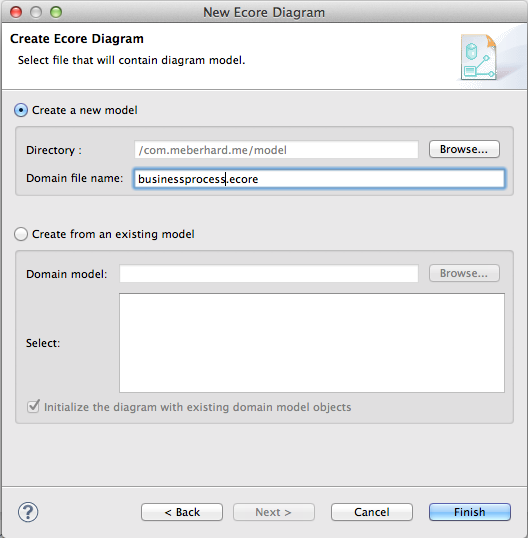 Create the EMF Ecore model for the business processes. The update EMF .ecore model. Add the EMF Generator model. 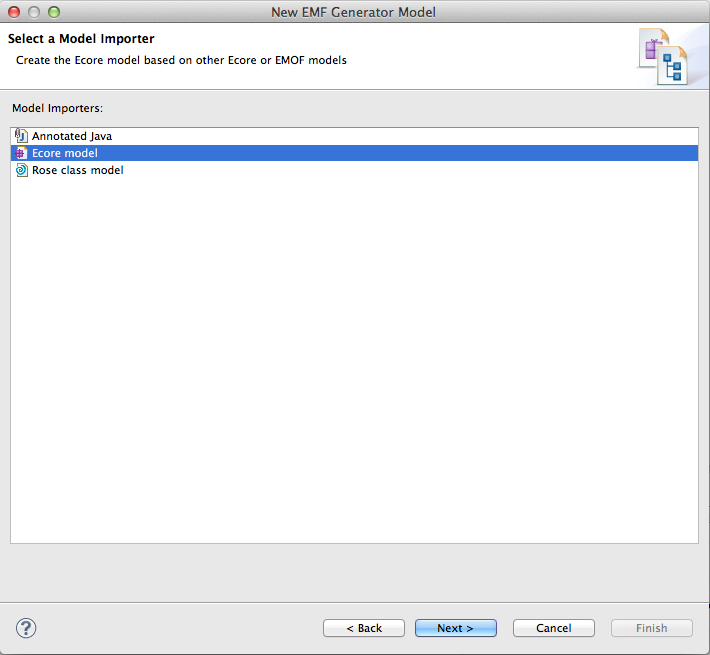 In the next step, be sure, that the model folder is selected and give a name for the EMF generator model, i.e. “businessprocess.genmodel”. 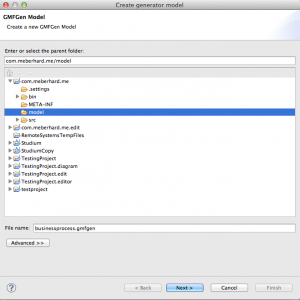 Select folder and name for the EMF generator model. 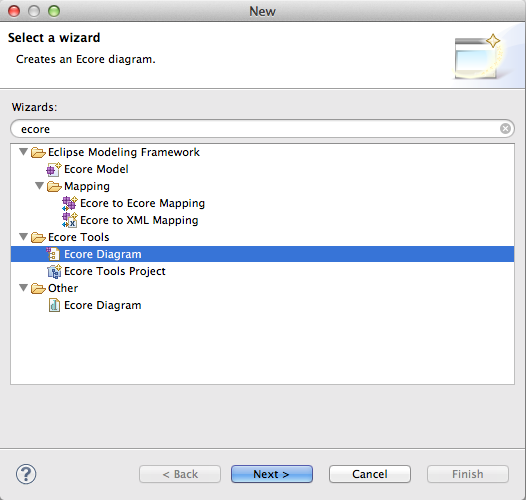 During the next step, we need to choose the model importer, select “Ecore model”. 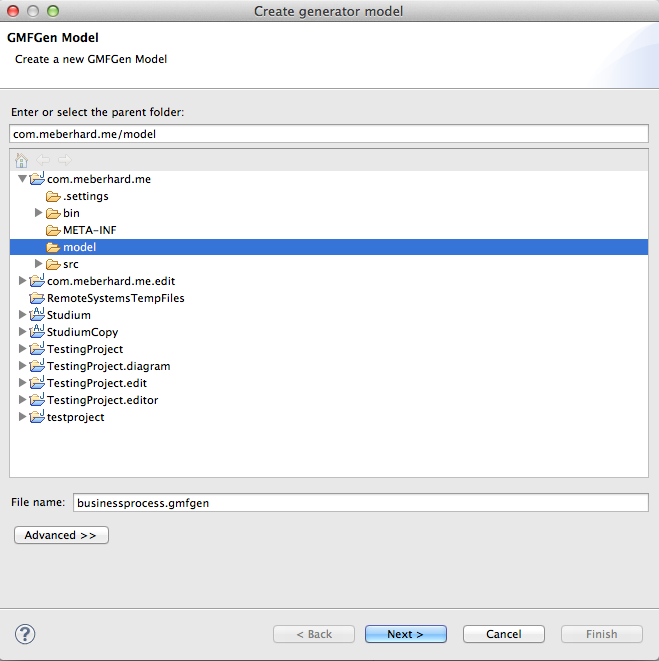 Select the model importer for the generator model. 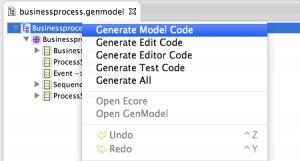 Select the ecore model for the generator model creation. 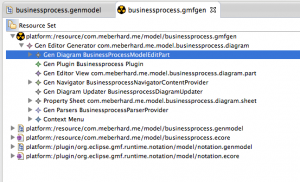 The genmodel file of the project. 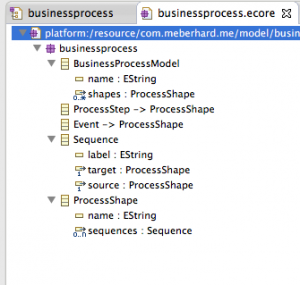 We need to set the base package,select the first entity “Businessprocess” and open the Properties view. 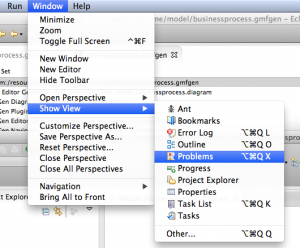 If it is not opened already, open it using right-click on “Businessprocess” and clicking “Show Properties View”. 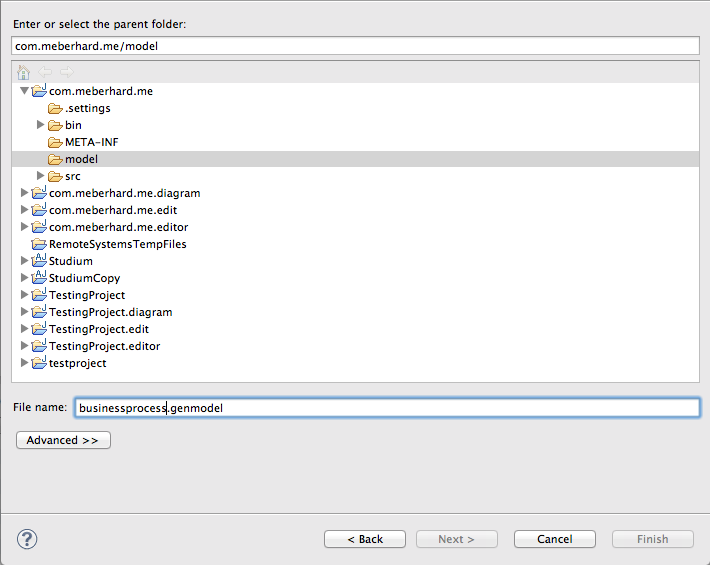 The basepackage needs to be set to the project name and the folder, in which the model resides. In my case, the name of the project is “com.meberhard.me” and the folder “model”, so the name of the base package is “com.meberhard.me.model”. Properties view of the genmodel. Now everything is set to generate the model and the edit code. 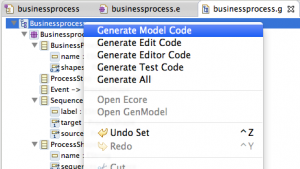 Right click on top element “Businessprocess” in the .genmodel file and click “Generate Model Code”, do the same again and click “Generate Edit Code”. Generate the model and the edit code. If this step went well, you should now one new project in the workspace, ending on .edit, additionally the model code should be created in the “src” folder of your base project. 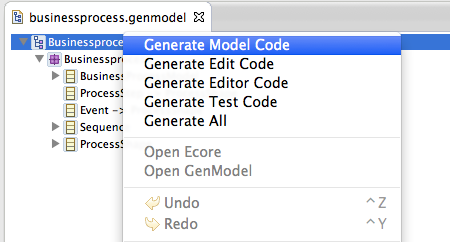 We start from “Domain Gen Model” – click on “Select” and choose the .genmodel file, which we created. 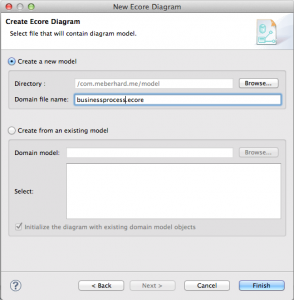 After, click on “Select” in “Domain Model” and choose the EMF .ecore file, which we created. 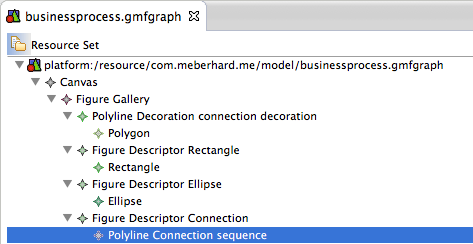 After that, click “Create” inside “Graphical Def Model”. 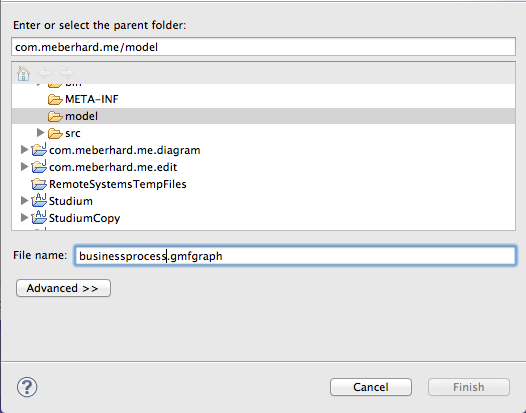 Select again the “model” folder in the opening view and set the name to “businessprocess.gmfgraph”. 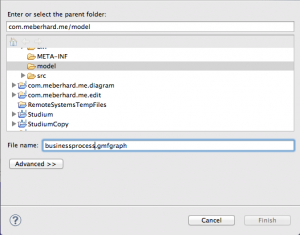 Creation of the GMFGraph model. Adding a Figure Gallery in GMFGraph. Updated gmfgpraph file, containing the Figure Gallery. Right-Click again on the “Canvas” element and insert two children of the type “Node”. 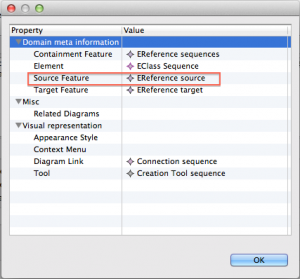 Use the properties of the first Node to give it the name “event”, in the dropdown next to “Figure” choose the “Figure Descriptor Rectangle”. 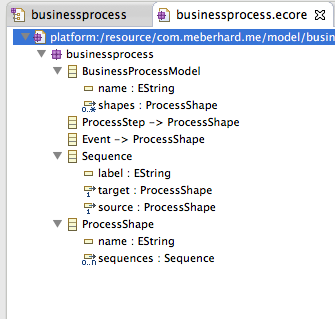 Give the second Node the name “processStep” and choose the Figure “Figure Descriptor Ellipse”. This means, that events will be represented by Ellipses and processSteps by Rectangles. Going back to the GMF Dashboard, click on “Create” in “Tooling Def Model”. In the opening view, select the “model” folder and give it the name “businessprocess.gmftool”. 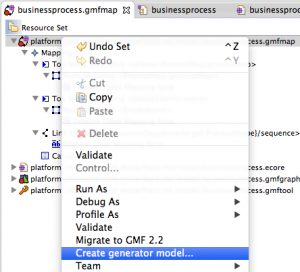 Creating the GMF tooling file. Creation of the GMF tooling file. 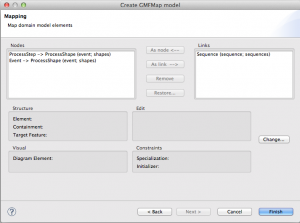 Right-Click the “model” folder of the project, select “New” -> “Other” and choose “Guide Mapping Model Creation” in the opening view, it is inside the folder “Graphical Modeling Framework”. 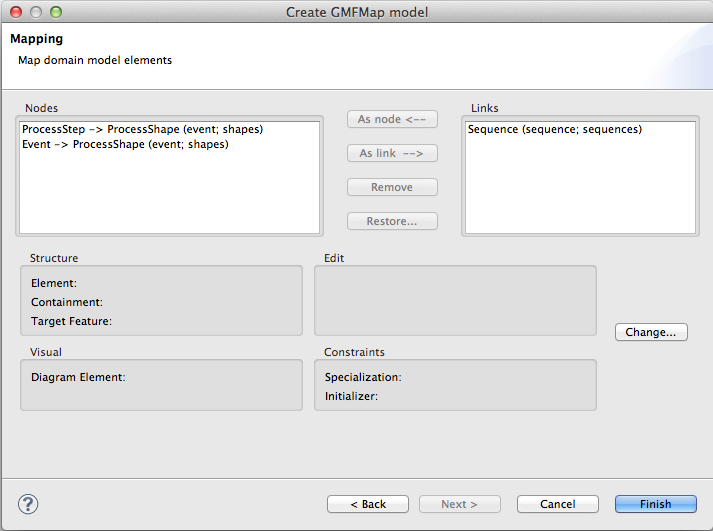 Add the Guide Mapping Model Creation to the model folder of the project. 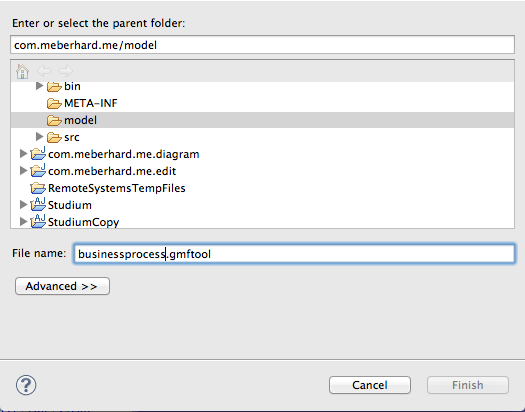 Make sure, that the folder “model” is selected and choose the name “Creation of the GMF tooling file”. Adding the file gmfmap to the project. 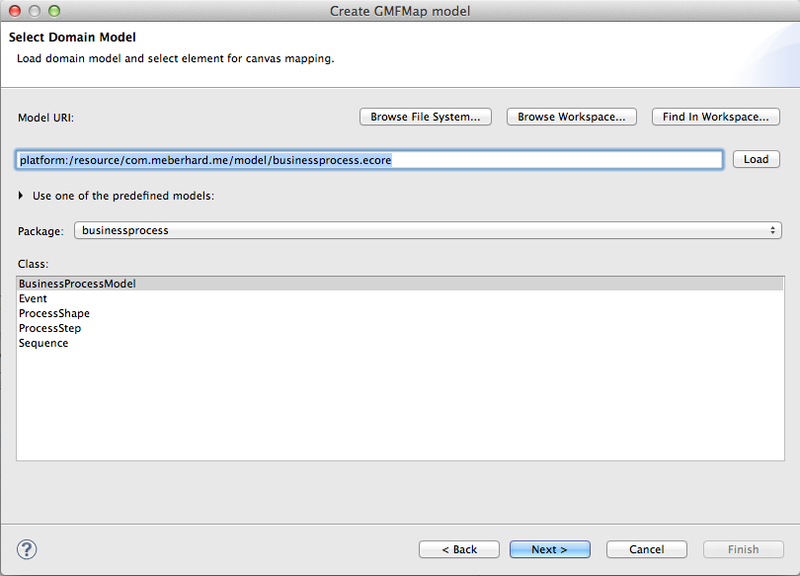 The Select Domain Model model view while creating the GMFMap model. 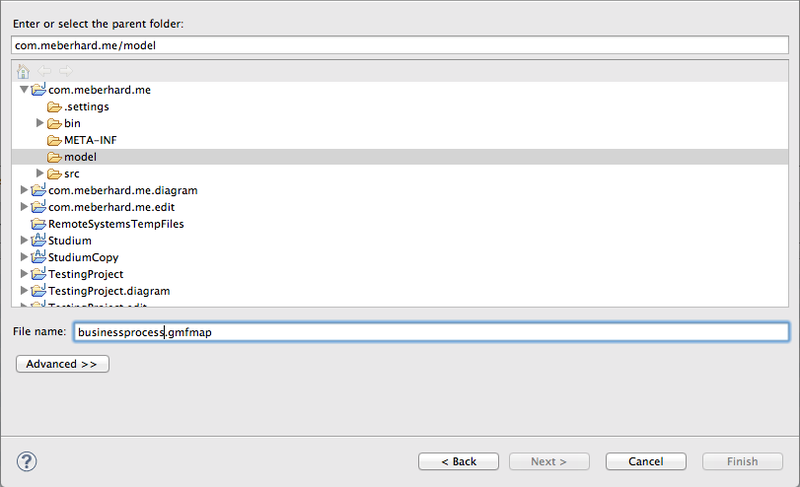 The mapping when creating the GMFMap file. Click on the right side on “Sequence (sequence; sequences)” and click the button “Change”. Set the “Source Feature” to “EReference source” in the opening dialogue. Set the source feature to ERference source. Click “Finish” to create the file and open it. We need to make some manual amendments, i.e. adding the labels and fixing the mapping from processStep to Ellipse (because now both event and processStep are assigned to Rectangle). 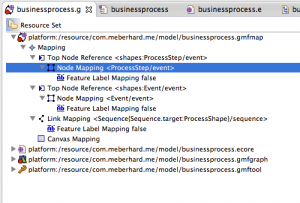 Choose the mapping, which contains “Top Node Reference <shapes:ProcessStep/event>”. 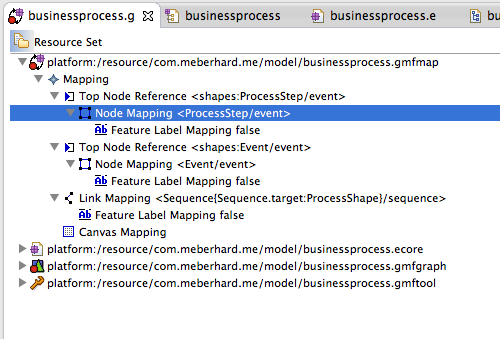 Open all children and open the properties of “Node Mapping <ProcessStep/event>”. 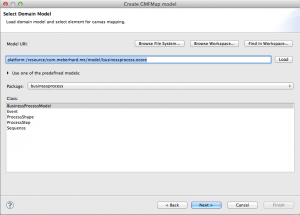 Altering the properties of the GMFMap model. 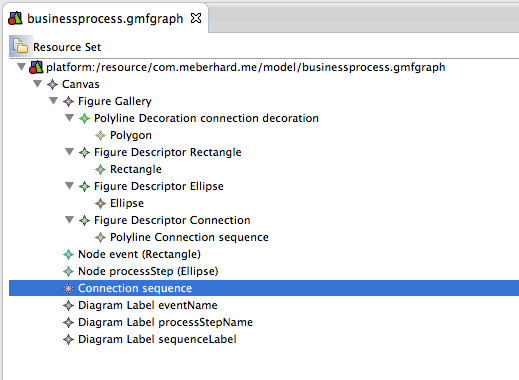 In the properties, change “Diagram Node” from “Node event (Rectangle)” to “Node processStep (Ellipse)”. After, select the “Feature Label” of the three mappings and assign the processStepName label to the processStep, the eventName label to the event and the sequenceLabel to the sequence. Example of the Diagram Label assignment. 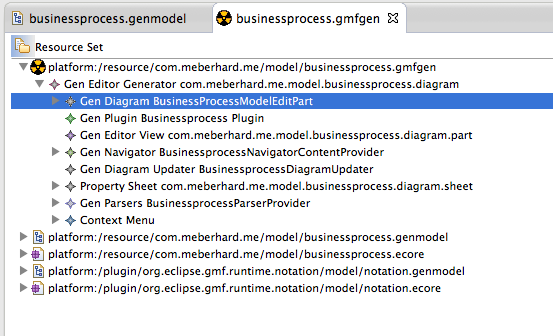 After this is done, right click on the first element of the list and click on “Create generator model”. 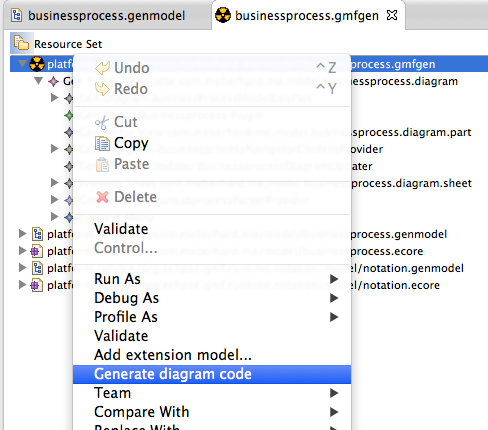 In the following view, be sure that the “model” folder is selected and choose the name “businessprocess.gmfgen”. Don’t change nothing in the following views, click next until you are able to click Finish. After clicking “Finish”, the file “businessprocess.gmfgen” should be available in the “model” folder. Open the file, right-click the first element and click “Generate Diagram Code”. 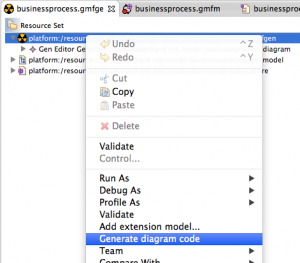 Generate the diagram code from the gmfgen file. Your workspace should now contain a new project ending in “.diagram”. 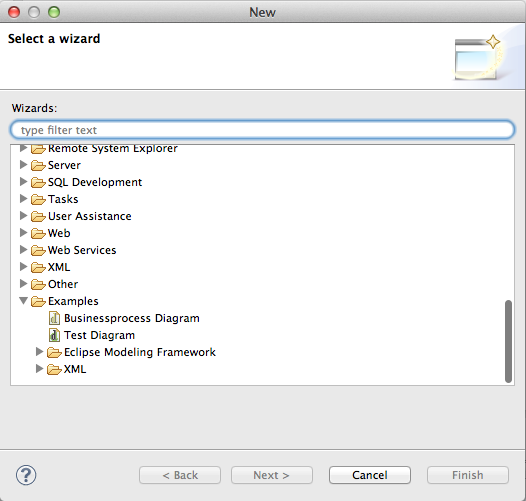 Right-click the project and click on “Run as” and choose “Eclipse application”. 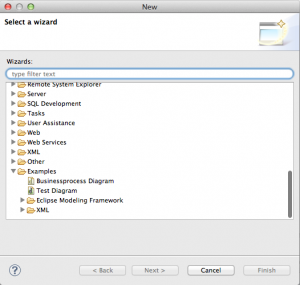 Run the .diagram project as eclipse application. 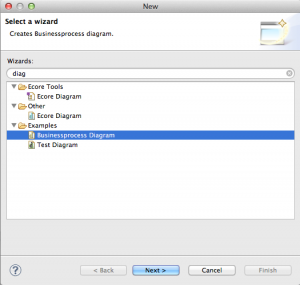 After the new eclipse instance opened, click the “New” icon and search for “Businessprocess Diagram” in the “Examples” folder. 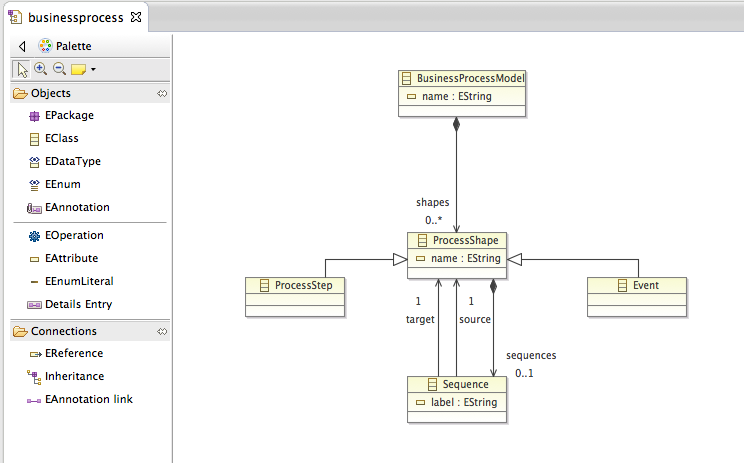 Add a new businessprocess diagram. 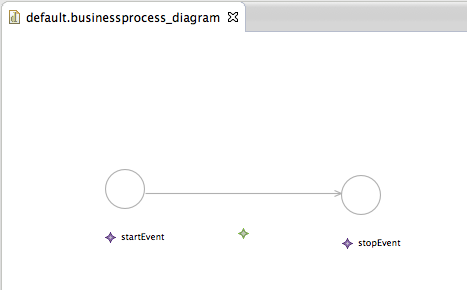 Now you are able to create a very basic process diagram, which consists of events and processSteps. You can use “sequence” in the “palette” to connect single symbols. 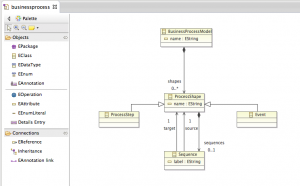 This entry was posted in Uncategorized and tagged business, eclipse, ecore, emf, gmf, meta-modeling, modeling, process on July 18, 2014 by Moritz Eberhard.